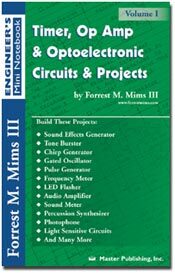 Volume I of the Forrest Mims Engineer's Mini Notebook series includes three of his best-selling notebooks: 555 Timer IC Circuits; Op Amp Projects; and Optoelectronics. This Engineer's Mini notebook features more than two dozen 555 timer circuits that you can build, including tone generators, LED flashers, sound-effects circuits, and a touch switch. It also includes more than 50 operation amplifier (Op Amp) circuits, many with simple formulas to help you modify them for special circuits of your own design. A wide range of optoelectronic circuits and projects are featured, including many LED circuits and various lightwave communication systems. 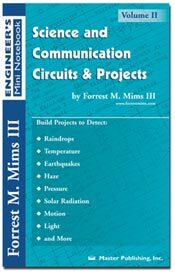 Volume II of the Forrest Mims Engineer's Mini Notebook series includes three popular notebooks developed by Forrest: Science Projects; Environmental Projects; and Communication Projects. These mini notebooks include wonderful science project ideas for students and hobbyists alike. Forrest's little books have stimulated many science fair projects and also have been popular with hobbyists of all ages. Even professional scientists have recommended them as a fun way to learn about electronics. You can use the plans in this Volume to make a simple seismometer by hanging a magnet over a coil; build a sun photometer and make accurate measurements of haze in the atmosphere; study rain, lightning, clouds, sunlight, water, temperature, and other topics; and build a wide variety of lightwave and radio communication circuits. 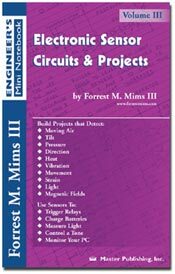 Volume III of the Forrest Mims Engineer's Mini Notebook series includes 3 of his best selling notebooks devoted to sensors: Sensor Projects; Solar Cell Projects; and Magnet & Magnet Sensor Projects. Electronic sensors convert light, temperature, sound, magnetic fields, and other signals into a form that can be processed by electronic circuits. Sensors have become an increasingly-important segment of modern electronics. Learn about important sensors like solar cells, photoresistors, thermistors, hall-effect devices, and magnet switches. Then use these sensors to build circuits and projects that respond to heat, pressure, light, touch, water, strain, lightning and magnets. You can even make a circuit that detects the presence of the cursor on your computer screen and the position of a compass needle. 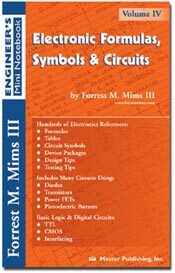 Volume IV of the Forrest Mims Engineer's Mini Notebook series includes four of his best-selling mini notebooks: Formulas, Tables & Basic Circuits; Schematic Symbols, Device Packages, Design & Testing; Basic Semiconductor Circuits; and Digital Logic Circuits. Together, these 4 Mini Notebooks provide a complete, basic electronics reference guide. Included are many frequently used electronic formulas, tables, circuit symbols, and device packages. Also featured are basic resistor and capacitor circuits, plus many circuits using piezoelectric buzzers, LEDs, FETs, and ICs. Also included are some 100 digital logic circuits ranging from simple gates and oscillators to sequencers, shift registers, and data selectors. Design and testing tips are provided to help you plan and troubleshoot your circuits.